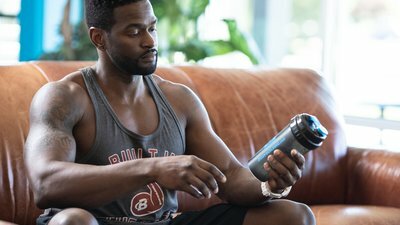 As Layne Norton, Ph.D., explains in the article "Creatine: What It Is and How It Works," "Creatine itself is a fuel source." More specifically, the phosphate-bonded form of creatine is "your body's first choice of energy when performing anaerobic activity, such as lifting weights." When your body is trying to create the compound that powers quick muscle contractions, ATP, it does so by "borrowing" a phosphate molecule from phosphocreatine and combining it with another compound, ADP. Only after a muscle has largely used up its store of phosphocreatine does it start to produce ATP from other sources, like glucose or fats. "Supplementation with creatine serves to increase creatine stores and phosphocreatine availability in the body, resulting in faster ATP formation," writes exercise physiologist Ciaran Fairman, Ph.D., in the article "6 Side Effects of Creatine Debunked." "Bottom line: The more phosphocreatine you have, the more work you can accomplish before fatigue sets it." A secondary function of creatine is to draw water into muscle cells, making them more hydrated. "When muscle cells are hydrated a few things happen, the most notable being an increase in protein synthesis," explains Norton. As many lifters will attest, this action of drawing water into the cell can also make their muscles look bigger or fuller.